The holidays are a lively and festive time of year, filled with decorations, gifts, and celebrations. But it’s also the time of year when we may unknowingly introduce our pets to toxic plants or dangerous foods. As you decorate your home this season and enjoy celebrations and holiday treats, keep a watchful eye on your pets, particularly if your celebrations include any of the following plants or foods. While lilies are not typically associated with the holiday season, they are actually a very popular flower in many flower arrangements. All parts of the lily plant are toxic including the flowers, stems, and even the pollen, which can be ingested through breathing, or licked from a cat’s fur during grooming. Even ingesting a small amount of a lily plan can be lethal. Signs of toxicity include racing or rapid pulse, rapid breathing, cold paws, vomiting, and lethargy. Prognosis for lily toxicity is very good when pet owners act quickly and pets receive the proper treatment. A staple of holiday decorations, holly is one of the most popular yuletide plants. However holly is toxic to both dogs and cats when ingested. English, Japanese, and Chinese varieties of holly contain toxic saponins which can cause severe gastrointestinal upset including vomiting and diarrhea. Christmas or English holly also contains methylxanthines and cyanogens, which are also harmful. Pets who have ingested holly will drool, smack their lips, and may shake their heads from injuries caused by the spiny leaves. While most of us hang our mistletoe high and away from our pets, it’s still important to know that this plant can be mildly to moderately toxic to cats and dogs when ingested. The berries from the mistletoe plant contain polysaccharides, alkaloids, and lectins which can lead to gastrointestinal irritation including drooling, diarrhea, vomiting, and stomach pain. When ingested in large amounts, mistletoe can result in abnormal heart rate, low blood pressure, ataxia (drunken walk), seizures, collapse, and even death. If you suspect your pet has consumed any of the above plants, we urge you to contact your veterinarian immediately or call the Pet Poison 24-hour emergency hotline at 1-800-213-6680. 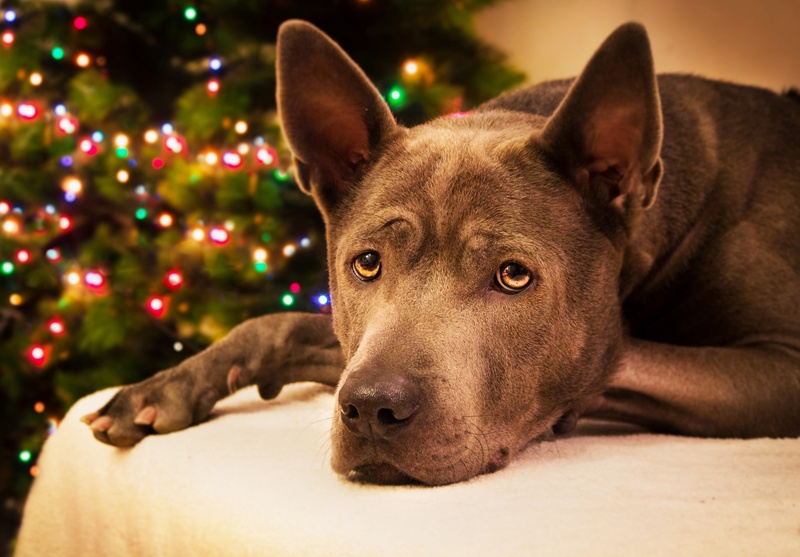 While most of us don’t think of our Christmas trees as plants, it’s important to know that chewing on or eating the needles of this favorite Christmas decoration can be mildly toxic to both dogs and cats. Pine needles are not easily digested and can cause stomach irritation, vomiting, or gastrointestinal punctures or obstructions. The oil in the needles can also irritate your pet’s mouth or stomach, causing vomiting and excess drooling. The needles on artificial trees can cause similar stomach problems and obstructions as on real Christmas trees. Artificial trees may also release toxins which can be harmful when ingested. While myths persist about the toxicity of poinsettia plants for pets, poinsettias are not highly toxic to either dogs or cats. In fact, poinsettias are only mildly toxic, and medical treatment for ingestion is not normally required. When problems do occur, gastrointestinal upset, vomiting, or drooling are the most common issues. Skin irritations can also occur if the pet’s fur or skin comes in contact with the milky sap of the plant. It's a good idea to keep poinsettias out of your pets reach, however, you don’t need to ban them from your home. While chocolate is a favorite gift and treat for humans throughout the holiday season and beyond, even small amounts can be toxic to dogs and cats. Dark chocolate is the most dangerous, but all chocolate contains methylxanthines that cause diarrhea and vomiting in most pets. Eating large amounts of chocolate can lead to seizures, irregular heart functioning, and even death. If you suspect your dog has eaten any chocolate, seek veterinary assistance as soon as possible. While alcohol flows more freely than usual around the holiday season, care must be taken to ensure pets don’t join in the fun. It doesn’t take much alcohol to cause life-threatening toxicity in pets, especially small dogs and cats. Ingesting alcohol can cause a dangerous drop in blood sugar, body temperature, and blood pressure. Some pets may also experience seizures or respiratory failure. Be sure to keep alcoholic beverages away from pets. And, please remember, rum cakes, fruitcakes, or other dessert treats may contain alcohol. And you may be surprised to learn that alcohol is also a byproduct of ingesting unbaked dough. Many of our favorite holiday confections start as unbaked dough, which can be dangerous when eaten by our furry friends. After ingestion, unbaked dough quickly expands in the warm, moist environment of the stomach resulting in bloating. The bloating progresses to gastric-dilation volvulus (twisted stomach). Signs of bloat or twisted stomach may include distended stomach, elevated heart rate, weakness, vomiting, or non-productive retching. When the yeast in unbaked dough is fermented, it produces carbon dioxide and alcohol. The alcohol is quickly absorbed into the bloodstream, resulting in alcohol poisoning. When preparing dough, be sure to clean up dough dropped on the floor immediately. You may want to keep pets out of your work area altogether. Nuts are a popular food consumed around the holidays, particularly in party mixes or given as gifts. Nuts are also a popular ingredient in cakes, pies, cookies and other holiday desserts. Many types of nuts can cause stomach upset, while some are toxic when ingested. Signs of toxicity can include stomach upset, vomiting, seizures, or neurological symptoms. If you suspect your pet has consumed any nuts, contact your veterinarian for advice on the proper course of action. Cookies, pies, and other favorite holiday treats often contain raisins which can be highly toxic for pets, especially dogs. Though the toxic substance responsible is unknown, both grapes and raisins (dried grapes) can result in acute kidney failure. If you suspect your dog has eaten grapes or raisins, consult your veterinarian. While keeping pets safe is a year-round challenge, it can be particularly difficult during the hustle and bustle of the holiday season. But taking extra care to choose plant decorations wisely, inspecting flower bouquets, and keeping dangerous foods out of your pet’s reach can go a long way to helping you and your pet enjoy a happy and safe holiday season. 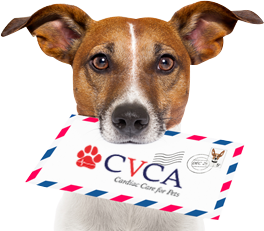 Happy Holidays from all of us at CVCA, the leading choice for veterinary cardiology.